The Bottom Freezer Refrigerator (a.k.a. bottom mount refrigerator) is one of the more popular refrigerator styles. You'll see a lot of the bottom mounted freezer refrigerator models in many of the high end brands such as: Subzero, Dacor, GE Monogram, Bosch, and Kitchenaid as well as the lower cost models made by LG, Samsung and Whirlpool. One of the advantages to a bottom freezer refrigerator is that the refrigerator is at eye-level which gives you more convenient access to the fresh food compartments avoiding the need to have to bend over. While we know that there is a great deal more information you may want to know about bottom freezer refrigerators (just read below) but we also wanted to give you a chance to go right to our favorite bottom freezer fridges by brand. 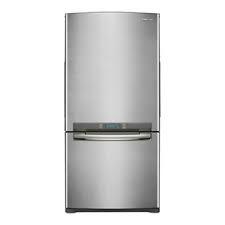 General Electric has many different lines of refrigerators that all fall under the GE name and all of which carry bottom freezer refrigerators in both the single and double doors (French door refrigerators). 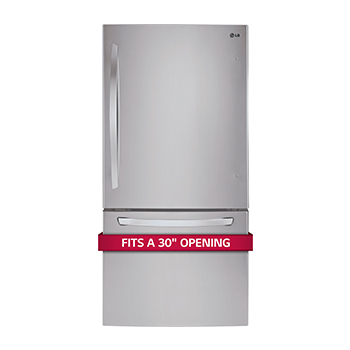 LG Bottom Freezer Refrigerators are some of the most innovative products out there (not to mention their high quality and low price)and have quickly become some of the most popular refrigerators on the market. 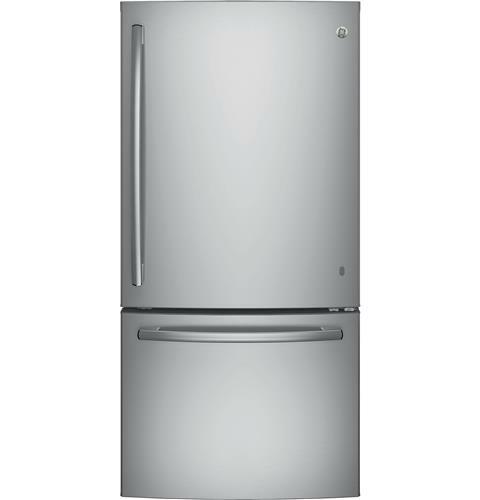 Samsung makes some very interesting bottom mount fridges that really make an impact in a small space. They started doing this for the countries in which space was limited but style was a premium. They also have some wonderful French door refrigerators as well. Lastly if you're not sure which brand of bottom freezer will work best for your needs, take a look at this page to see dozens of bottom freezer refrigerator reviews from many different brands. Just in case you actually want the double door or French door bottom freezer version, no worries, we have another list just like this one specifically geared toward them. Bottom Freezers are Perfect for Eating Healthy! If you're trying to eat healthier then chances are you're using a lot more fresh fruits and vegetables than most people. A bottom freezer fridge allows you to store all of your perishables in the refrigerator at eye level, rather than a drawer located near the floor. Many people jokingly refer to their vegetable crispers as their "vegetable rotters" because inevitably, every time you toss in a few bags of veggies, you tend to forget they're there. With a bottom mount freezer refrigerator, this problem is minimized simply because all of your fresh food items are easily accessible. The freezer sections on the other hand are usually pull out drawers which help you keep your frozen foods organized and easy to reach. There are a few models that have a swing out door instead of a pull out drawer for the freezer, so be sure to look at both to see which type you prefer. TIP: Many swing out door models come with reversible hinges, so see which way you need your door to swing before you head out shopping and adjust accordingly. Either way, the majority of bottom freezer models have pull out basket shelves which make accessing your frozen foods a snap. You'll probably still have to do a little bending to reach what you need, but the convenience of having your most commonly used items directly within arms reach will be something you'll quickly learn to love. TIP – The Freezer Drawers in a Bottom Freezer Refrigerator often come with a wide variety of organizational components that make food storage much easier, so make sure you take advantage of these options when you make your purchase. They are usually at an additional cost, but the effort and time saved over the years will more than make up for the few dollars you spend now. 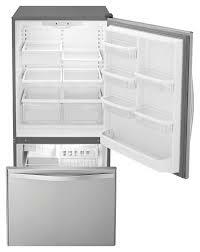 Most Bottom Mount Freezer Refrigerators have a bit less capacity than the Top Freezer Refrigerators. This is due to the extra space needed to alot for the pull out drawer. Bottom mount freezer refrigerators are also a bit more expensive and less efficient than the Top Mount Freezer Refrigerator models. The efficiency is compromised by the pull out drawer which is unfortunately the equivalent of pulling out your entire freezer every time you open the drawer. That said, these models tend to offer a wider capacity then the Side by Side Refrigerators which makes storing large dishes much easier. Refrigerators with bottom freezers also come in a French Door Refrigerator model, which is quickly becoming the most popular refrigerator model of its kind. French Door Refrigerators are a bit more expensive than the standard Bottom Mount Freezer Fridge, but they have an elegant look and they often come with all the features of the typical Side by Side fridge such as a built in water and ice dispenser with replacement walter filter cartridges. So, even though these models tend to be a bit more expensive than the Top Freezer Refrigerators, the conveniences this style offers may very well be worth the extra money. Don't forget that the convenience of having a refrigerator on the top has changed refrigerators immensely. This new, very popular style of refrigerator began with only one door and quickly branched out to french door (or two door) bottom freezer fridges. The french door version fits in almost any kitchen where the single door may be limited by space and opening. This is why most brands make a limited single bottom freezer selection and a plethora of French door models. Take a look below at the various brands of bottom freezer fridges. Bottom Freezer Fridge Reviews: If you're ready to dive in and start reading refrigerator reviews on bottom freezer fridges, this is the article for you! French Door Fridge Reviews: If a French door bottom freezer is what you are looking for, then this article lists several dozen refrigerator reviews by brand to help you find the perfect fridge for you. Top 10 Rated Refrigerator Models: A number of the top 10 refrigerators are bottom mount freezer refrigerators. Look especially at the Dacor and Viking models as they are well priced and highly touted in consumer reviews.